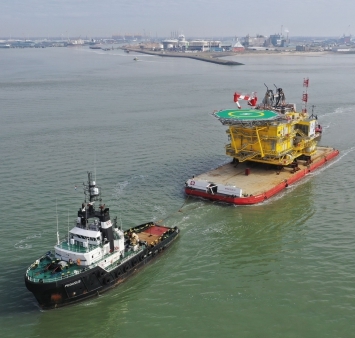 On Tuesday 19 March, the substation topside for the Deutsche Bucht offshore wind farm was shipped from Vlissingen to Eemshaven as the way to the construction site is shorter from there. 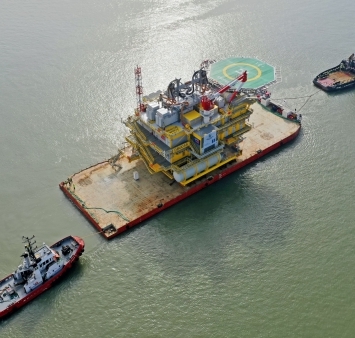 The transfer to the construction site, situated 95 kilometres northwest of Germany’s Borkum Island, will take place after the jacket installation and as soon as there is a suitable weather window for the installation. The topside, with its length of 37 m, 19 m height and a weight of approximately 2,700 tons, was assembled at the Damen Shiprepair Vlissingen yard. The topside will be installed on the 61 m high jacket, which was assembled at the Verbrugge yard in Vlissingen and set sail from Eemshaven towards its final destination on 26th March this year. The joint-venture Smulders-Eiffage was contracted by Van Oord for the engineering, procurement, construction and installation of the Deutsche Bucht topside and jacket.